UV curing equipment comprising a lamphead of small dimensions and an independent electrical cabinet. Small and compact UV lamphead. 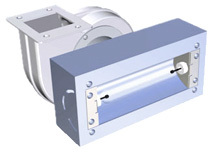 Elliptical extruded electro-polished reflectors for optimum distribution of the ultraviolet light. Medium pressure 100 W/cm ultraviolet lamp (different wavelengths available). Cooling by fan attached to the lamphead, with the possibility of another location using flexible hose. Electric control cabinet with working selector, mains net signal, lamp indicator and timer.